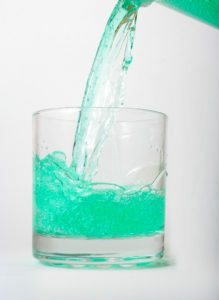 Mouthwash is a great addition to brushing and flossing, but just like any other product, there are many to choose from. Read on for help in deciding which mouthwash is right for you. If you are suffering from gum disease, which causes your gums to become inflamed and infected, or experience bleeding when you brush your teeth, an antiseptic mouthwash may be for you. Look for a mouthwash containing chlorhexidine 0.2% to help with severe gum disease. For more mild cases cetylpyridinium and hydrogen peroxide will work as well. If you want to get rid of, and prevent plaque from forming, you will need a mouthwash with antibacterial ingredients. Ingredients such as zinc chloride, triclosan and cetylpyridinium chloride all have antibacterial activity and can help reduce plaque formation. Essential oils such as thymol, eucalyptol and menthol are also effective, as they penetrate the plaque film and have an antibacterial effect. Most mouthwashes contain essential oils. If you are struggling with bad breath and brushing alone doesn’t cut it, a mouthwash with antiseptics or essential oils may help. Bad breath may also be caused by a dry mouth, so a moisturizing mouthwash may help. If your mouth is sore after visiting the dentist, or you have mouth ulcers that cause you pain, you may want to use an anti-inflammatory mouthwash. Benzydamine is a good anti-inflammatory. Benzydamine works by reducing the swelling and inflammation in the mouth, therefore reducing pain. It also has a mild anaesthetic effect which will help to numb pain in the gums. Mouthwashes containing benzydamine are only used for a short period of time, usual seven days. Ask your pharmacist to advise on any dental pain and using benzydamine mouth rinse. If you are looking for a mouthwash to whiten your teeth, look for a mouthwash containing hydrogen peroxide and sodium fluoride. Hydrogen peroxide acts as a bleaching agent that helps to remove stains from the teeth, it does not actually give the teeth a brilliant white finish. The whitening effect is seen by the hydrogen peroxide removing the strains, so making the teeth appear whiter and brighter. Dentists use higher concentrations in professional whitening procedures, so look for the highest concentration of hydrogen peroxide in your mouthwash to help whiten teeth. If you are prone to cavities, and want to do everything you can to prevent them, look for a mouthwash containing sodium fluoride. Sodium fluoride helps to protect the surface of the teeth that can be damaged by bacteria in plaque. The bacteria feed on sugars in the mouth and produce acid that dissolves enamel crystals on the surface of the teeth. This is known as demineralization and leads to the loss of enamel on the teeth. Minerals such as fluoride, calcium and phosphate that are found in saliva are deposited back into enamel by a process known as remineralization. The balance between remineralization and demineralization needs to be maintained to prevent tooth decay. If you are using a fluoride mouthwash, you should avoid eating or drinking for at least 30 minutes after using it. This is to avoid the fluoride being washed off the teeth. Most mouthwashes target multiple areas in this list, look for the ingredients that you need, and if you still can’t find a mouthwash, ask your dentist.